With Bandai America’s Power Rangers toyline winding down before Hasbro takes the brand in a new direction next year, one of the last releases the company has to offer has just been spotted at US retail. 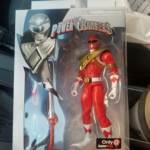 The Gamestop Exclusive Legacy Armored Red Ranger was just spotted at retail by Mando Arriaga over at the Power Rangers Traders, Buyers, and Sellers facebook page! As one of the tail end releases in the line, the Armored Red Ranger has made the packaging change the rest of the most recent Legacy product has like Psycho Red, Dino Thunder White etc. So it’ll fit right in with your other end of the line purchases. As one of the last new Legacy 6.5″ releases to hit retail, will you be hunting this figure down yourself? Let us know in the thread linked below! Dispatched to Earth’s moon on a mission to free Rita Repulsa by the mighty Dark Spector, was the original Psycho Ranger. When the NASA moon landing inadvertently woke this slumbering villain in 1969, Alpha 5 & Zordon had no choice but to assemble a team, the original Power Rangers! Inexperienced, isolated, caught off guard, the Power Rangers would have to contend with, Psycho Green! Released as an SDCC 2018 Exclusive, the Legacy Psycho Green Ranger is (simultaneously with Psycho Silver) the first release of this mold in North America. Though the Psycho Red & Blue Rangers have turned up internationally, Green & Silver mark the domestic debut for this new mold. If you have experience with the Legacy 6.5″ line at all, then you know exactly what you’re in for here. Throw in the premium-style con packaging and Psycho Green’s signature Psycho Dagger, and you get a solid release and introduction of what to expect from his mold mates. I’ve done my best to recreate some panels from Green’s debut issue so I hope that comes across. Enjoy! We’ve attached the full 80 image gallery to this post but you can also read our full review by clicking “Discuss on the TokuNation Forums” at the bottom of this post. 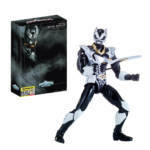 Next time we take a look at the simultaneously released Legacy Psycho Silver Ranger! Today, Bandai America responded directly to our Twitter question regarding the availability of the Legacy Psycho Green Ranger figure exclusive to this year’s San Diego Comic Con. The Power Rangers In Space Legacy Psycho Green Ranger figure will be available exclusively at the BOOM! Studios booth #2229. Stay tuned for pricing and quantity available. As we enter a brand new age of Power Rangers toys and collectibles we are definitely ending the previous era with a bang! Revealed earlier this morning, a skew of Power Rangers toys are being offered as convention exclusives at this year’s San Diego Comic Con. Even more shocking – not all of them are being offered through Bandai America. The Legacy Psycho Silver figure will be available at San Diego Comic Con at the Entertainment Earth booth (#2343) for $45. You can pre-order any remaining figures from the show by clicking here. One of the most anticipated wave of figures from Bandai America‘s Legacy 6.5″ collector line is the Psycho Rangers. We had confirmation that the original five (Red, Blue, Black, Pink, Yellow) were being released and as soon as they were, fans began to ask about Psycho Silver. As you recall, the Power Rangers In Space battled valiantly against the Psycho Rangers but always got bested by them until they realized each Psycho is programmed to best fight against the same color. As the Power Rangers lay exhausted, Psycho Silver appears and quickly finishes them off. His arrogance at fighting all the colored Rangers causes infighting amongst the Psychos until Psycho Blue injures his comrades in an attempt to fight the Blue Ranger himself. It is at that point we learn that the Psycho Silver is actually the In Space Silver Ranger, and together with the other Power Rangers In Space, destroy Psycho Blue. Order your SDCC 2018 Legacy Psycho Silver figure now. San Diego Comic Con 2018 is just around the corner, so it’s time to see what Bandai America has cooked up for their last SDCC Power Rangers exclusives! This years’ exclusives pack quite the punch and should quench the thirst of many fans. 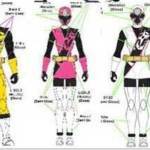 Despite some uncertainty about wether some upcoming Legacy 6.5″ figures would even be released at one point, these exclusives mean that all 7 of the Psycho Rangers will indeed be released at some point. What a time to be a fan! Details on when and where these items can be purchased coming soon. SDCC 2018 runs from July 19th-22nd! Amazon Listings Up for Legacy 6.5″ Psycho Pink , In Space Silver, & Ninja Steel Rangers! I imagine it went something like this. Bandai: “The reports of my death are greatly exaggerated. Despite popular thinking to the contrary, a new wave of Power Rangers Legacy 6.5″ figures has actually made it’s way up for order by way of Amazon! The image we’ve used for this article comes from the original reveal that these figures were possibly being developed, back in October 2017. There are no official stock images for any of these figures currently. These listings have surfaced seemingly out of the blue. But it likely confirms the line is quite far from dead before Hasbro begins releasing it’s Power Rangers product next year. Curiously absent for now are the Psycho Yellow & Black Rangers to complete that team, as well as a Pink Ninja Steel Ranger. For now the listings are not active, but they can be added to a wish list if you’d like to keep track of them. When these listings go live we’ll be sure to update you! 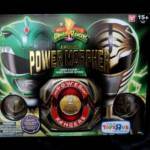 It’s been a while since we’ve tackled a Legacy release from Bandai, and with their time with the Power Rangers license coming to end, we thought it appropriate to take a look at one of their last high end releases. Making it’s way out to retail currently at Toys R Us (as they go our of business themselves) is the Legacy Zeonizer! It’s unfortunate that this collector’s piece is heralding the end of the line, and a retailer, but we wanted to take a look at it while we could. The Legacy Zeonizer is the latest in Bandai’s line of high end prop replicas, and frankly it may be their best effort. A wonderful recreation of the morpher used in Power Rangers Zeo, this collector’s piece features a number of built in light & sound gimmicks including unique Morphin’ call outs and specific colors for each ranger. Of course the icing on the cake is it’s best feature, the ability to play the entire Power Rangers Zeo Opening Theme! You can check out our full 40 image gallery of the Legacy Zeonizer as well as a full review and breakdown of it’s features by clicking “Discuss on the TokuNation Forums” at the bottom of this post. We’ll be back next time with a gallery from Kamen Rider Kabuto!